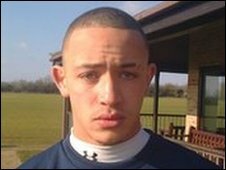 Oxford United have signed winger Ashley Cain on a one-month loan from Championship side Coventry City. The 19-year-old will provide cover for the injured Alfie Potter and will go straight into Saturday's squad to face Kidderminster in the FA Trophy. Cain impressed in a behind-closed-doors friendly against Oxford United and has also spent time on loan at Luton Town. "I'm fast, I like to get at people and supply. I hope I can get some goals too," Cain told BBC Oxford. The Nuneaton-born teenager is a product of the youth academy at Coventry City and has made eight appearances for them. "The move was a bit out of the blue. I need some games, and it is hard for me to get that at Coventry at the moment," said Cain. "I'm here to help, try and improve the squad and hopefully get some goals. I am really looking forward to playing here."